At APEC 2019, Toyochem will exhibit the Lioelm FTS series of thermally conductive adhesive sheets for bonding substrates to a heatsink. They can also be used as an insulating layer in power device packaging. Designed for applications where efficient thermal management is critical, for example in automotive applications, Lioelm FTS sheet was developed using Toyochem’s heat-resistant resins. The resulting heat-conductive product is flexible and has reliable heat-dissipating properties, says Toyochem. During development, researchers in Japan solved the performance trade-off issue encountered between the elastic modulus and thermal resistance that typically arises in conventional epoxy-based thermal interface materials. Lioelm FTS’s soft consistency (low modulus) and special rheology, allows it to fill every void and conform to every rough surface, to create a high strength interface between power device components or substrates. According to Toyochem, this results in optimum heat transfer and reduced thermal stress, making it possible to reach the low levels of thermal resistance necessary to transfer or insulate heat effectively. 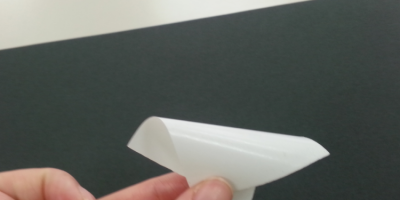 “At the moment, the new adhesive sheets are undergoing trials in LED light modules and other power devices, “ reports Masashi Arishima, general manager of Toyochem’s new material & system business department. He is optimistic that the material will gain a foothold in the US and Europe in particular in hybrid and electric vehicles development. Toyochem also produces Liometal SB nanosilver pastes for high heat-resistant and pressureless sintering of a semiconductor chip to a circuit board. The company’s original nano-particle design allows Liometal pastes to create uniform layers of sintered silver that exhibit both excellent durability and adhesion under high temperatures. Toyochem is a wholly owned subsidiary of the Toyo Ink Group and oversees the Group’s polymers and coatings-related business. Toyochem manufactures polymers, adhesive tapes, marking films and coatings for a variety of industrial applications.